This 1982 Carvin DC160 was my first "real" electric guitar. On the plus side, it had unusual pickups - the pickups had 12 pole pieces rather than the usual 6 and this arrangement gave it a natural chorus effect even without the use of an external chorus pedal. 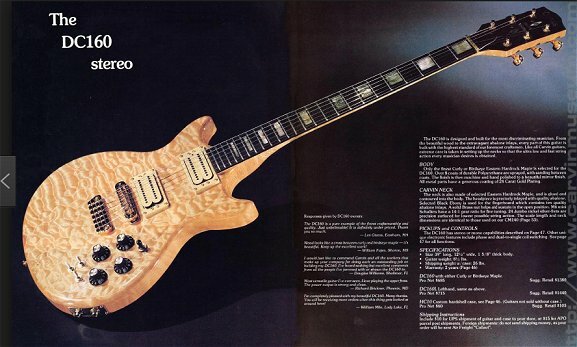 It had stereo outputs which I never really fully comprehended back then, and it had 24 frets. Tons of tonal possibilities. On the minus side were those deep cutouts without longhorns on BOTH sides of the body near the 24th fret. While this seemed like a good idea at first, in reality it makes the guitar always want to level itself out horizontally instead of naturally assuming an upright vertical angle, so I was always fighting with the guitar to get it pulled up into a playable position. 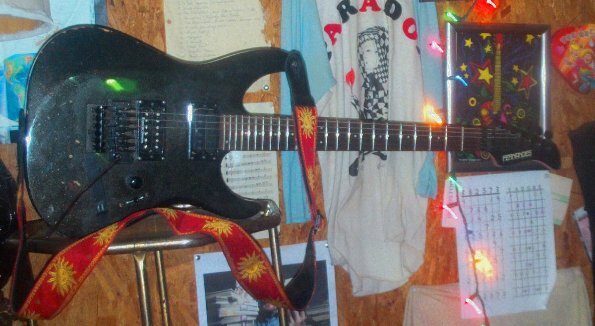 Another guitar I used for a long time was a Yamaha RGX110. This was a kinda cheap guitar, but it played really well. It is very lightweight, has the Ibanez-like double cut-away body style that I like, and has 24 frets, it does NOT have String-Locks, and has just one Humbucker pickup. Played it until it needed a fret job, but by then I was really wanting a guitar with String-Locks, so opted to find another guitar. The Fernandez Sustainer - this is the guitar I used for the recordings on this website. Fernandez makes a lot of guitars with weird body styles, but they also have some that have more traditional body styles. A Fernandez guitar that I like a lot and have gotten a lot of mileage out of is the Fernandez Sustainer guitar. The one I have has a body like an Ibanez, and has a built-in Sustain circuit based on a transducer that injects the string vibration directly back into the string so you can get amplifier feedback effects at low volume. It also has 24 frets, Floating Tremolo, String-Locks that I must have these days, and fine-tuning adjustments as part of the Floating-Tremolo Assembly for adjusting intonation after the strings are locked down. I couldn't find a Model Nr. on the guitar (bought it in a Pawn Shop), but Fernandez still makes Sustainer guitars with all of these features and body-style.You can hear the long sustains in the intros and at the tail end of many of the recordings. 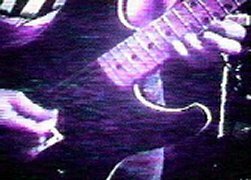 While in college, I won a Blue-Burst 1983 Ibanez Roadstar II RS-315 Delux solid-body electric guitar which was being given away as the door-prize at a little nightclub in College Station, TX where Eric Johnson was playing for one night. This was 1983 before he got famous. Eric Johnson autographed the back of that guitar with a magic marker, but this was before he was all that well-known, and I didn't protect the signature with lamination or otherwise, so the signature eventually wore off - probably would be worth something now! Anway, I've been pretty much hooked on Ibanez guitars ever since - they always have really good fret action, very playable. I played with a country band for a little over a year. At first I used an Ibanez "GiO Series" GRGRA32T and I replaced the neck pickup with a single-coil pickup. I played in several garage bands back in the 1990's. I played the Ibanez I had won. I played in a garage band we named "Paradox." 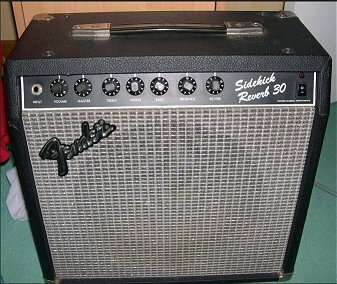 I let the Bass Player use the Carvin Half-Stack and I bought a little Fender Sidekick 30 Amplifier, then later, added a 2nd Fender Sidekick 30. I figured two would be twice as loud as one, right? Well, it doesn't exactly work that way - volume is logarithmic, but it was louder, AND it allowed me to go stereo with my chorus pedal which sounded really cool. 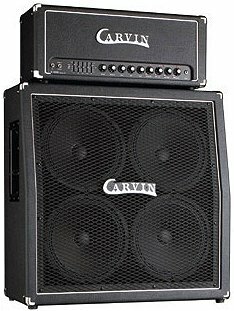 I also got a Carvin Half-Stack Amplifier and Cabinet which had 4 12-inch speakers in a cabinet, and that was really more volume power than I needed, but it sounded really great, and LOUD makes you just feel good, doesn't it? It was such a "balls-ie" amp that I let the Bass Player use it in our band, Paradox, and I opted for something smaller to get a better overall mix. 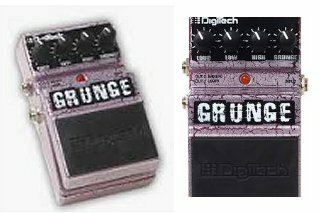 The primary distortion pedal I used for this website has been the DigiTech "Grunge" Distortion Pedal. Some of the later recordings also ran thru a VooDoo Lab "Sparkle Drive," the "Mod" version. The Grunge Pedal of course provides that mean growl while the Sparkle Drive can brighten up the tone and adds even more gain to the signal for feedback effects. 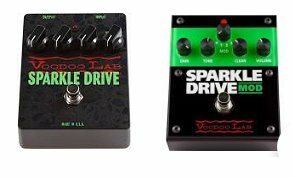 The VooDoo Lab Sparkle Drive by itself is a great overdrive pedal that can provide overdrive without coloring your tone. It is a popular pedal for country music, and it is the Overdrive Pedal that I used while I was in the country band. The "Mod" version has more options, more flexibility. 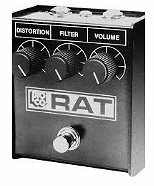 Honorable mention goes to the Pro Co "Rat" Distortion Pedal. 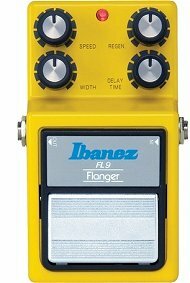 It was the first decent Distortion Pedal I ever came across, back in the day. Another Distortion Pedal I liked was the Washburn "Stack-In-A-Box." When it first came out, its selling-point was that its circuitry was based on FET's rather than regular transistors( BJT's), so its distortion profile more closely resembled overdriven tube distortion. The Stack-In-A-Box does have a unique tonal quality, sort of vocal, like a Wah-Wah Pedal. 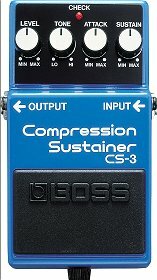 I used a Boss DD-5 Digital Delay for the recordings on this website. I did't use any Reverb, Chorus, or Flanger effects. The signal path also ran thru an Alesis 3630 Stereo Compressor before going into the computer for recording. I now know there are better Compressors out there to be had, but it was what I could afford at the time. 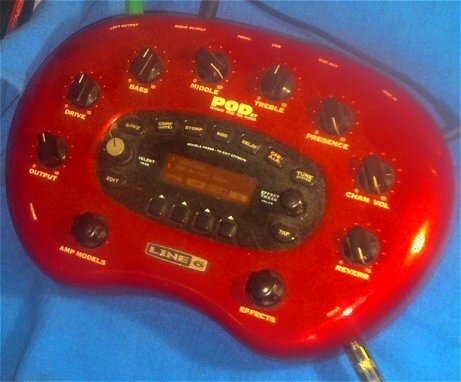 At first I was using a DigiTech GSP-21 Pro Guitar Signal Processor for effects and signal-processing while in the country band - then, on my very first gig, I plugged it in, and all my programming was GONE! Apparently, the backup battery had lost connection at some point during transport. So I had to scramble around digging thru my stuff to come up with pedals to get me thru the night. After that wonderful experience, I've always used individual effects pedals for gigs. Inspite of the above, the DigiTech GSP 21 Pro has been very useful in my studio. It has some pre-programmed effects patches that you would be hard-pressed to piece together yourself with pedals, it has one that sounds like the band U2, and it has some weird stuff, like Reverse-Reverb. I've been using the DigiTech GSP 21 Pro lately as a Vocal Processor to add Mullti-tap Delay, Chorus, Reverb, Equalization, and Enhancement to vocals. This last effect, "Enhancement" is a proprietary fixed equalization that boosts certain frequencies to cause whatever you're enhancing to stand out in the overall mix - you just set the amount of "Enhancement" that you want, 1 thru 10. 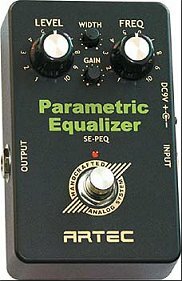 Guitar Effects Pedals that I still use regularly are a Boss CS-3 Compression Sustainer and an Artec SE-PEQ Paramertic Equalizer. 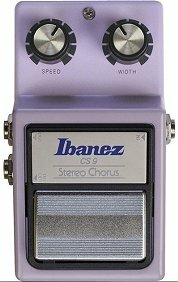 Other guitar effects that I've used in the past are an Ibanez CS9 Stereo Chorus, an Ibanez FL9 Flanger and a Boss DD-20 Digital Delay (aka the Boss "Giga Delay"). 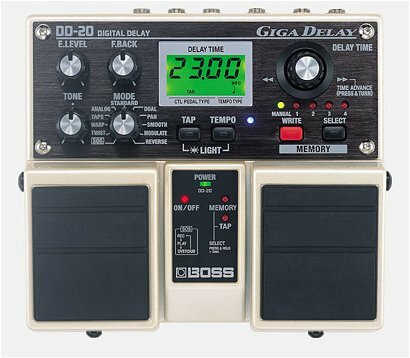 The Boss DD-20 can delay up to 23 seconds which means you can have it repeat entire measures of music. It also features "Tap Tempo" which means you can set the delay time by tapping out the beat of your song on one of its pedals.In addition to Delay, it can also continuously loop a recorded passage, up to 23 seconds. 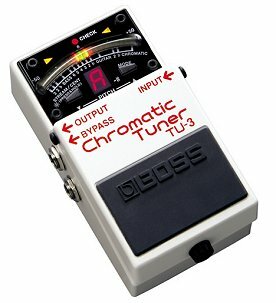 One other piece of gear that I use that has been very helpful is the Boss TU-3 Chromatic Tuner. 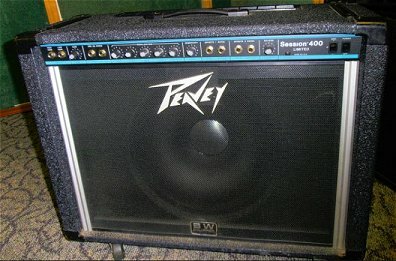 I bought a Peavey Session 400 Guitar Amplifier in 1996. Its a 400 Watt transistor-based Amplifier with a 15 inch B&W (Bowers & Wilkins) speaker. It can provide a very clean sound and it is LOUD. It's built-in Reverb is also very nice. The downsides are that its kinda limited in the amount of Bass it can deliver - its a Guitar Amplifier and won't do as a Bass Amp. Also, the only built-in effects are Distortion and Reverb - it doesn't have the extensive list of built-in effects that are common in Amps these days. 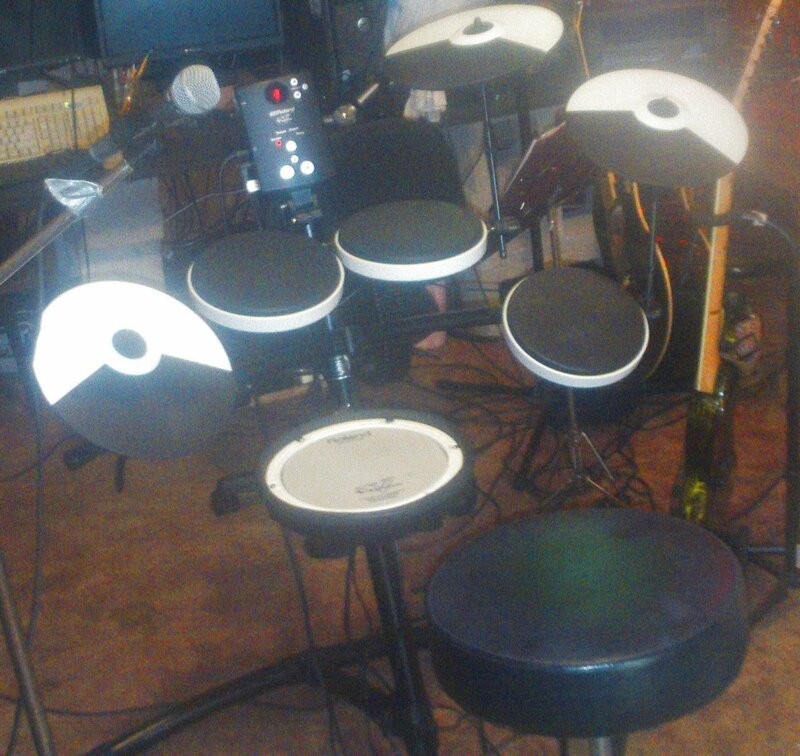 I have a Roland TD-1K Electronic Drum Kit for recording drums. This is the cheapest of the Roland V-Drum line. I route its output thru a dbx 166A Compressor Limiter. I found that the drum sounds needed some leveling out - without the Compressor/Limiter the Kick Drum makes my speakers pop. The recording mix comes out of a computer and just into a Sony STR-D515 AM/FM Stereo Receiver and then out into a pair of Pioneer HPM-40 Stereo Speakers. 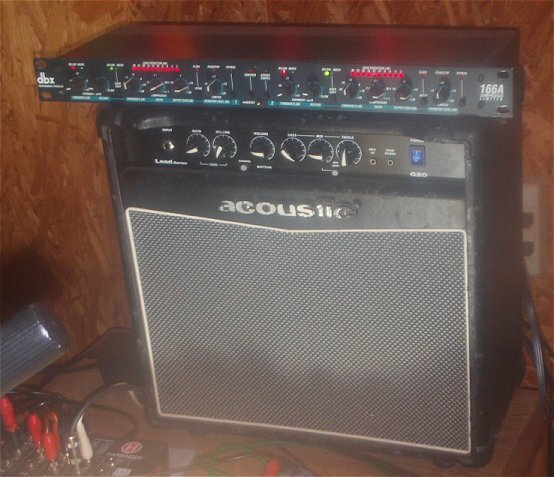 I use the little Acoustic G20 Guitar Amplifier as a monitor so I can hear myself play if things get too loud. 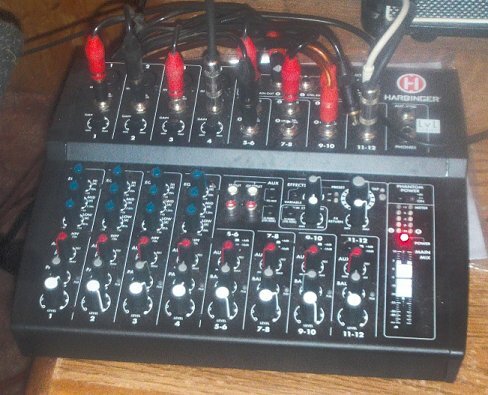 A Harbinger L1202FX 12-Channel Mixer has provided just enough mixing capability. The Line 6 POD-XT models/simulates various Amp and miked Speaker Cabinet combinations. I use it so I can record line direct into the computer without using microphones or nasty-sounding direct outs. The POD of course has a ton of effects on-board if you need them. I picked up a Shure Brothers "Unisphere I" Model 565SD Dynamic Microphone years ago in a pawn shop without really knowing what it was. Turns out its a "Classic" mic, was used at Woodstock, and is the predecessor to the Shure SM58. I also have a Shure SM58, and honestly, I like the older Unisphere 565SD better for vocals, its much "brighter," has much more treble than the SM58. We were gigging, so I figured I needed more than one guitar for backup. I bought this beautiful green-splatter Ibanez "RG Series" RGR320EX. I replaced both Humbucker pickups with single - coil pickups to get that high-pitched country twang and "spank." It has all the features I look for in a guitar - body style, 24 frets, at least two pickups, Floating-Tremolo with fine-tuning adjustments for intonation, String-Locks, and of course playability which you can only discern by actually playing the thing. Funny, I don't recall having 5 fingers . . .